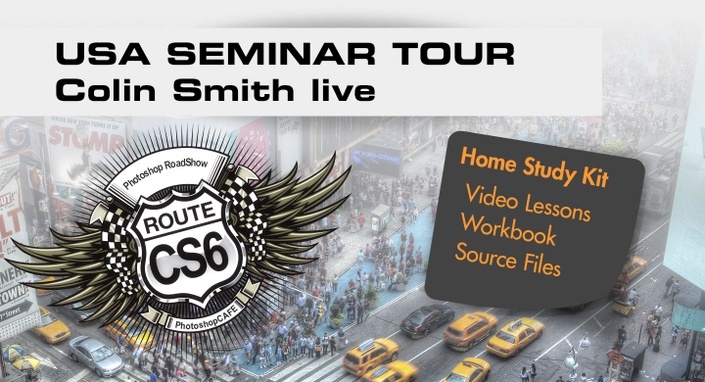 Route CS6, The Home Study Course! (For CS6 and CC) You missed the PhotoshopCAFE USA tour? You attended, but want to re-live the experience? No problem! We recorded the live event at a packed-house at the Los Angeles Convention Center. From Colin's screen to your screen at home, the CS6 event of the year is coming to you. This exciting release includes all the video, a 170 page digital workbook AND the instructor's files for you to follow along at home. There has never been a learning resource like this before, at any price, but we are making it available to you for only $79.99. (Videos, 150 page Digital workbook and Colin's source files) See the tour site The Author Colin Smith is founder of the #1 PhotoshopCAFE online community which has received over 20 million visitors. Colin has Authored/Coauthored 18 books. He has won numerous awards including 3 Guru awards. He's been nominated for the Photoshop Hall of Fame twice. Colin is a regular columnist for Photoshop User Magazine. 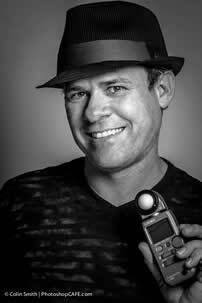 He's been featured in almost every major imaging magazine, and is in high demand as a speaker at major industry events including Flash Forward and WPPI . He consults such companies as ABC Disney, Apple and Adobe Get your motor running! Blazing speed - breath-taking quality with Photoshop CS6. You have asked and we have answered the call. People have been raving about how much they love the training on PhotoshopCAFE (over 30 million served) and the DVDs. You asked if we could bring this same quality of instruction to a live event and the answer is YES! It's taken us a few years to make it all happen, but now, this is it. We heard that people are craving training from an instructor who is more than just a teacher. You demanded someone that has worked in the industry and has a proven track record of producing world class results, that clients actually pay good money for. Colin has been commissioned by companies such as Microsoft, Toyo Tires, Proctor and Gamble, Saatchi and Saatchi, the film and music industries and more. He is going to show you techniques that work in the real world and how to get results that clients will pay money for. It doesn't matter if your client is a fortune 500 company, an individual or even yourself. This is the tour that will give you the confidence you need to step up to the plate and hit a home run every time. No fluff, this is the real thing. For one day only, in each city, Colin will roll up his sleeves and take you on an insider's journey through Photoshop, live and in person. It doesn't matter if you're a photographer, designer, are a seasoned pro or a hobbyist, there's something for everyone. You have the opportunity here to not only get a solid grasp of Photoshop, but also get a rare look into the hottest technologies and techniques, all in plain English. Imagine learning what you have always wanted, without the boring technical jargon.